S6 Pupils – Some of our S6 pupils were presented with certificates at their last assembly before going on exam leave for participating in our paired reading scheme This scheme supports younger pupils with their reading skills. Head Girl, Anna Hulme now relates the events of the last day for S6 in school: On Friday the 4th, the sixth year leavers went for a day out to Roller Bowl in Inverness. On arrival, we all sang happy birthday as Anju surprised David with her legendary chocolate cake! The bowling was very competitive, and the teachers, Mrs. Whall and Mr. Port, were irritatingly good! We remembered the last time we’d been bowling together, at Nethybridge in first year. Judging by some people’s bowling they had not been back since! After a quick lunch we made our way back, most of us having a nap on the road. At the end of the school day we all rushed home and had nearly enough time to get dressed up for our leavers’ dinner. Some of the teachers were also invited to the dinner, and we all had a very enjoyable meal, with lots of laughs and tasty food. After we’d finished eating our huge three course meals, it was time for a photoshoot! Dozens of photos were taken of our small year group together for the last time, and everybody was keen to have a photo taken with their favourite teachers too! There were hugs and even a few tears, but I think I can quite safely say that we all had a very lovely last day! Click on the photo above to see some photos taken that day. 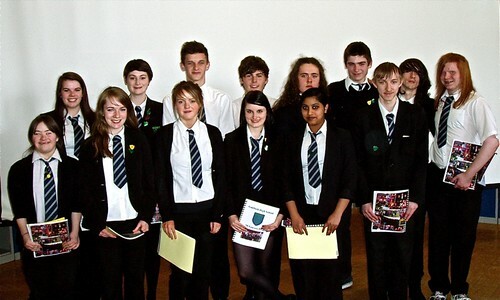 S6 Prefects also organized the production of their own yearbook and arranged for ‘leavers hoodies’. We wish them all well as they now sit their final exams prior to heading off to employment and continuing education across the country. Staffing – On Thursday 10th May interviews were held for the post of Art Teacher. Ms Gulliver retires in August and after discussions with the Council it was agreed that a national advert could be placed to secure a replacement. Details of an appointment will be confirmed as soon as appropriate. S4 Young Orienteering Leaders Award – As part of their S4 Skills for Work course, Rebecca Griggs, Caitlin Johnston, Ross Brogan, Danielle Bulmer and Luke Murray have recently gained a Young Orienteering Leaders Award. To gain their award the pupils learnt how to coach the basic skills of the sport, lead fun activities to help practice orienteering skills and ran an orienteering competition for the S2s at Flowerdale. Certificates will be awarded at assembly when the pupils return from exam leave. Sports Relief – The total funds raised for Sports Relief was £517.65. The money was raised by having a sponsored mile walk around the school along with hospitality provided by the S3 pupils on the day. Thanks to everyone who contributed towards the final amount. Culture Club – We had a full bus of pupils, ranging from S1 – S6, along with several members of staff on Wednesday night, when we travelled over to Inverness to see Scottish Ballet’s newest venture, ‘A Streetcar Named Desire’. The ballet was based on the 1949 play of the same name by Tennessee Williams, which became more widely known through the 1951 film, starring Vivien Leigh and Marlon Brando. In the ballet, the complex storyline was made very clear, (most felt that it was clearer than in the film), and the sensitive subject matter was beautifully portrayed by the dancers in a style that had traditional aspects but a very modern feel. A wonderfully sultry, score reinforced the atmosphere of the poor quarter of this Deep South city, which was conjured up by a simple yet ingenious set. The result was a tremendously powerful performance, which everyone appreciated and enjoyed. We’ve definitely moved on from ‘Sleeping Beauty’! Comenius Trip to Athens 23rd-29th April – A description of this trip is available by clicking here. Pupil Success – S4 pupil Rebecca Griggs has been offered a position on this year’s Local Fèis Rois Ceilidh Trail. Becky will take up employment for the month of July after impressing selectors at audition with her performance. Becky will train with other musicians in Plockton and then tour extensively for three weeks. Well done to Becky for achieving this prestigious placement. S3 pupil Sofie Banister continues to gain confidence and success with her horse riding. She has performed well in several competitions recently receiving Reserve Champion Show Ponies at Kilmaurs Show, 1st Best Young Rider at the Dundonal Show and 1st Show Ponies and Champion Show Ponies at the Puddledub Show, Ingliston. She also got consistently high ride marks at weekend shows in Cumbria and Cheshire. Last year Sofie took overall reserve champion in the Arabs at The Royal Highland Show at Ingliston and she will be trying to repeat her success this June. S2 pupil Jordan Gorman got a mention in the Scotsman, The Press & Journal and the Ross-shire Journal in articles about the male and female U14 Scotland Basketball teams. Basketballscotland will be hosting the International Summer Slam at Meadowbank on 8-10 June – coinciding with the weekend when the GB Women Pre-Olympic Games squad take on Canada at the same Edinburgh venue. Former Pupil Success – Amy MacLeod, currently in her third year of a Sport Science degree at University of Glasgow has been awarded her Silver Duke of Edinburgh’s Award. Well-done Amy! The Enigma Machine – All pupils and staff got the chance to see (and touch!) 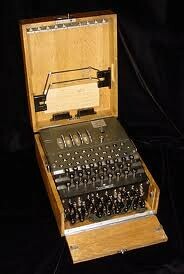 an original Enigma machine on Friday 11th may. Dr Mark Baldwin gave two lectures to pupils about codes and ciphers before explaining the workings of the machine. Both talks were exceptionally interesting and we are very grateful to the Russian Arctic Convoy Project Group for creating this rare opportunity. Click here to go to the Russian Arctic Convoy Museum website. Comenius Trip to Athens 23rd-29th April – At the time of writing, third year pupils Holly Morrison, Ciaran Alexander and Innis Taylor are still in Greece, touring world heritage sites such as the Acropolis and the Tomb of Agamemnon on what is the last trip in this two-year Comenius project. They are enjoying their stay with host families and spending time with students from our partner schools in Latvia, Germany and Italy as well as Greece. Watch out for their full report in the next Gairloch and District Times and news of their Greek evening, to be held later this term. Profesional training and development – Managing Mountain Walking Groups. Many staff at Gairloch High School provide a wide range of outdoor activities in addition to their curricular commitments. The training and certification of those staff generally takes place in their own time outside working hours. Even with qualifications, training needs to be updated regularly and on Sunday 22nd April five members of staff from GHS and a former pupil attended a refresher on ‘managing mountain walking groups’. Teacher Jim Sutherland is also a Mountaineering Instructor and led this training session. The experience and aspirations of the six made for a varied and challenging day for all involved. Three members of staff hope to sit their Summer Mountain Leader this year; another wanted to review navigation techniques, another member of staff wanted to learn about more formal methods of navigating on the hill. Our former pupil was also there to revise his compass and mapwork. “In the morning the group discussed planning procedures for leading school groups. Issues such as the Scottish Access Code were also covered before heading out to do some navigation near Shieldaig. In particular the group looked at pacing distances, walking on a bearing and interpreting contours. This training will support Duke of Edinburgh’s Award expeditions, Nethybridge Week and other activities that occur regularly. Former Pupil Success – Mrs. Flora Morrison, our former PT Support for Learning, has sent us a publication available in Inverness. The booklet is called Spotlight and seems newly published; it is dated May 2012. We were very pleased to have highlighted that the booklet contained within an advertisement for Cantraybridge College Open Day. Our interest lay in the fact that it showed a photograph of one of our former pupils. Gary MacKay is seen in the photo holding a trophy. It is great to see that Gary appears to be doing well and that he has been chosen by the college to represent the success of their courses. Well-done Gary! 106 Stories – Last week a new book became available for sale in the shops and the Library. Produced by Two Lochs Radio and the Gairloch Writers’ Group the book contains a selection of the stories entered for the 106 Word Story Competition. It is an excellent collection and as well as containing a selection of stories from the adult entries and many written by the local primary children, it also contains stories written by pupils from the High School. The following secondary pupils have had their stories chosen from entries to be published. Well done to all of them and the others who entered the competition! Megan Crueize (1st Prize), Sofie Banister (2nd Prize), Fraser Hinchliff (3rd Prize) in the 12-17 category. Siobhan Vickerstaff, Charlotte Kelman, Oscar Howard, Alfie Gudgeon, Ian Paul, Holly Morrison and Kenneth MacKenzie, all of who received commendations. Stories written by Charlie Bulmer, Charmayne Fraser, Matthew MacLean, Jerome Broome, Rosie MacKenzie, Mairi Wyatt, Rowan MacKenzie, Kiera Clark, Deborah Connop, Ciaran Alexander, Jasmine Easby, Patrick Hill, Joseph Stewart and Alexander McFeddries can also be found in new publication. Ruairdhri Wright (S6) who is planning to go the Art School after the summer provided some of the illustrations for the book. Errata – Mairi Wyatt was presented with her Bronze certificate and badge at the end of last year and not recently as stated in last issue. Important Dates – Available on the website. S3 exams finished on 27th April. Teachers are now marking scripts and preparing reports for parents. On Friday 4th May S6 have a final school trip to the Rollerbowl in Inverness. S6 have also arranged a meal out with staff in the evening. This will give us a final chance to collectively wish them well for the future. Monday 7th May is a holiday and school is closed. As of Tuesday 8th May all of S4, S5 and S6 will be involved in SQA national exams. The S1 Nethybridge trip begins on the 14th May. S2 and S3 pupils will be getting an alternative timetable for the week and we plan to give them longer periods of time tackling particular tasks. For S3 this will include a full day of emergency first-aid training prior to taking part in Duke of Edinburgh’s Award expeditions.